When Matt Johnson needed to do research on NASA space missions past to make “Operation Avalanche,” he went straight to the source, traveling to the Johnson Space Center in Houston to interview NASA officials and collect footage from inside mission control, only he did so under the guise of being a student filmmaker making a documentary about the Apollo program since telling them about his real intentions might get him kicked off the grounds. In actuality, Johnson could claim he was a student filmmaker — “Operation Avalanche” was his master’s thesis for York University, rocketing to the world stage a bit earlier with the clever comedy “The Dirties” in which he could credibly play its high school-aged lead. But as a filmmaker who clearly enjoys seeing how a little fiction can bring out a greater truth, it’s only natural that he gravitated towards making a film about the long-held myth that Stanley Kubrick helped stage the 1969 Apollo 11 moon landing, a plot unlikely to inspire NASA officials to greet him with open arms. 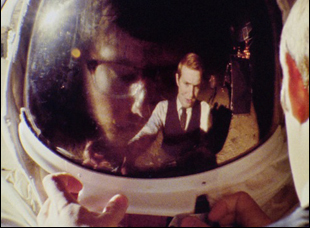 Not only did Johnson actually infiltrate NASA to make “Operation Avalanche,” but he inserts himself into the film in a similar role, casting himself as Matt Johnson, a member of the CIA’s AV department who’s winding down from another mission investigating whether Kubrick actually drew on classified government materials to make “Dr. Strangelove” when he and Owen Williams (who previously played Johnson’s cohort under his own name in “The Dirties”) are called upon when it looks like Neil Armstrong and company may fall just short of the moon. While the onscreen Johnson is ambitious to be sure, stopping at nothing to keep up the ruse, the offscreen one may be even more so, again using the implied intimacy and truth of the found-footage approach to mess with the mind, employing vintage lenses, clever visual FX, and visits to real locations such as Kubrick’s favored Shepperton Studios to make the blend of fact and fiction seamless. Both incredibly provocative in its subversion of history and wildly entertaining, “Operation Avalanche” is further evidence of a truly exciting new filmmaker on the rise and as I found when I spoke with Johnson and his producing partner Matt Miller, the audacity is hardly limited to his films, with the writer/director eager to engage in conversation about the challenging qualities of his work and the challenges of actually doing it, going to great lengths to pull off such a sly and subtle yet effective style of filmmaking. A lot of people make a found footage film as their first film just to show what they can do before moving on to something bigger. What made you want to return? Matt Johnson: We’d always been shooting in that fake documentary style, but never in a serious way and there was so much cool stuff that we discovered. We made a web show that was shot in the same style, except we were just doing it as a joke. We weren’t really formally trying to break any new ground. Then with “The Dirties,” it was like, “Oh, you can actually use this technique to do some stuff that is really trippy,” like shooting in the real world with people who don’t know they’re on camera in a narrative movie where the stakes are actually quite high. We did that before in comedy where the whole point was just to make people laugh, but when we made “The Dirties,” it was like “Whoa, this is like a new world.” We could have our characters experiencing real things and going through big moments in their personal life and the rest of the planet in that. After “The Dirties” was done, Miller and I right away wanted to do something in the same form because we hadn’t really done everything that we thought we could do with the format and because we actually had developed a very unique set of skills that would have just been abandoned if we’d made a straight narrative feature afterwards, so we wanted to make this next movie in the same style. Also, we didn’t think we would have a lot of money, so those things all conspired together to say, “Just do the exact same thing again.” But creatively, it’s an interesting place to be [where] you make a film with the same characters, the same thematic space, the same formal technique, but the story is completely different. I’ve never seen a filmmaker do that before — Matt and Owen in “The Dirties” AND Matt and Owen in “Operation Avalanche.” That is trippy and interesting, so we wanted to see what that was like. From the start, did you always know you were going to name these characters Matt and Owen? Matt Johnson: I think so … there was never any discussion about it actually. That’s just what we always do. Matt Miller: It’s an integral part of the process. We’ll do 45-minute to an hour-long takes, so you’re in and out of character in all those moments. The idea of having to have the crew, or [Matt] and Owen even, refer to you guys as a different name [would make it complicated]. It was a trick [Matt] developed very early on in the web show where it was just like, “Oh if I call myself [my own name] and I’m just playing myself, then if we’re always shooting, I can use anything [we shoot],” whether it’s intended to be used or not. We end up using those moments all the time in the film. Matt Johnson: We were more conscious of it in this movie. In fact, at the beginning, we do an opening credit sequence where you see us forging our I.D. badges for NASA and as soon as it cuts to color and we’re driving from Virginia to Galveston, Texas, we introduce the two cameramen — and me and Jared — and we try to have them talking more. We show them on camera as much as we can. That was a very conscious shift from what we did with “The Dirties” because one of the alienating things about “The Dirties” for a lot of people, who weren’t young, was that we restricted the identity of the cameraman. I don’t think either of us would have changed that at all [about the movie], but we were trying to open up the process with this film because it’s much less cerebral then “The Dirties” was in terms of how the audience is meant to engage with it. We needed to have those questions be at least slightly lower in the rung of things the audience was concerned about. We didn’t want you thinking [while watching the movie], who’s filming this, and why? Whereas with “The Dirties,” we did. [Questions like] how is this being filmed? Why is the cameraman not saying anything? What is the implication of that? is in fact a part of the pulp of the movie. Matt Johnson: We couldn’t put it in the end. Matt Johnson: …Once the train leaves the station you can’t stop. Once the movie is “Okay, we’re faking the moon landing,” the audience’s attention [span] will not allow you to then leave that momentum and tell a story over here. You just can’t. Matt Miller: Whereas “The Dirties” was all about meandering because that’s what adolescence is about. It’s about hanging out in the basement with your best friends, hiding from the rest of the world and figuring out how to make it. When you’re dealing with actual history people are familiar with, does that make the storytelling process feel like filling in the pieces of a puzzle? Matt Johnson: Yes, that is what it felt like. “The Dirties” was similar because we shoot so much. You wind up with ten million pieces and you’re only going to use a thousand. Matt Miller: But “The Dirties” was like one of those puzzles that my two-year old kid plays with where there is only one place for everything to go. Matt Johnson: Oh I disagree. Matt Miller: I’m just saying comparatively. Matt Johnson: Yes, but your metaphor is actually mixed. With ”The Dirties,” we had a hundred pieces and we could have put those pieces together one way or another, but the film would have been the same. With “Operation Avalanche,” it was extremely specific. Those pieces were very small and if you put them together in the wrong way, then the film doesn’t work at all. Matt Miller: Just the complexity of the puzzle, it was a much harder puzzle to crack. Matt Johnson: That is what it felt like. I would say 90 percent of the writing happened in the editing room. 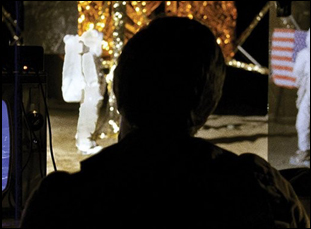 “The Dirties” was the same, but with that movie, the room for error was so much more compared to “Operation Avalanche” – [here] if we spent three seconds lingering on a shot we found, you could tax the attention of audiences beyond the point of credibility. It was brutal. Not to give anything away, but in the film, your characters attempt to use green screen and available technology of the 1960s to create the lunar experience – was it a bit of art imitating life as you were inserting yourself into historical footage with current smoke and mirrors? Matt Johnson: Actually, because those few moments, specifically with Stanley Kubrick and whenever we did the very Forrest Gumpy “there I am in the ‘60s”, took so much work for Tristan, our VFX artist, to do, I tried to improvise those scenes. Even the scene with Stanley Kubrick is improvised. Then you give it to Tristan, he works eight months straight on those sequences and once they’re sealed you close the door on those ideas. You basically don’t get to see them until they’re done eight months later. Matt Miller: Although we changed that mission control scene. Matt Johnson: Quite a bit. We re-shot it at the last minute, but those were the few things we knew from the very beginning we knew we wanted to have in the movie and we made it our goal to force those in. Matt Miller: One thing that is similar [between] “The Dirties” and “Avalanche” is there were set-pieces we knew we wanted in each of them, so [those bigger scenes] were all the stuff we were able to shoot when we had our big crew and had the support to pull those things off. Then once we had them, it was all about finding the pieces in between those set-pieces to connect everything. You really get a consistency and the tone of the film through the way color is tinted throughout, as well. Could you do a fair amount of that in camera or did you work with a colorist? Matt Johnson: It was a mix. Conor Fisher was our colorist, a very smart guy working out of Toronto who we love and also colored “The Dirties.” We realized he needed to work very closely with Pablo Perez, who did all our 16 millimeter transfers. Once we shot the movie and more or less had a lock, I would go with the cinematographers to the color studio and we colored the entire movie. As reference points, we used archival footage and documentaries from that period. Mostly “Gimme Shelter,” to be honest. Then we sent everything to the lab and Pablo worked for two months putting everything to 16 millimeter [transfers]. We broke it into reels and everything went to sixteen. Then we brought everything back to Conor and spent another week in the color studio. It was a lot of back and forth. We had a great reference [for the color scheme], which was the actual footage that NASA shot at Galveston in the 1960s. We knew what their 16 millimeter [footage] looked like and we had to keep working until our footage matched that. It’s not like we were just inventing that look. We were very specifically trying to match our shots to what we already had in the movie because a good 10 percent of what you’re watching is actually archival footage from NASA. Again, in [that opening sequence] when we’re driving to Texas, we cut to archival footage all the time and when we’re at NASA, we cut to archival footage all the time, so we needed to have that be our look. We just kept working until we had it. “Operation Avalanche” opens on September 16th in Los Angeles at the NuArt Theater and in New York at the Landmark Sunshine Cinema. A full list of theaters and dates is here. Interview: Erin Heidenreich, Cassandra Sanford-Rosenthal & Maria Toorpakai Wazir on Unveiling "The War to Be Her"
TIFF '16 Interview: Fatima Al-Banawi, Hisham Fageeh & Mahmoud Sabbagh on Introducing Saudi Arabia Cinematically in "Barakah Meets Barakah"